When cells are subjected to gamma irradiation or certain chemotherapeutic drugs, the chromosomes and in particular the DNA within the chromosomes are damaged. As a consequence, the cells respond by stopping cell division to repair the damage. If the repair is not possible because the damage is too extensive, the cells initiate a self-destruction process called programmed cell death. We have discovered that a particular protein, called Gfi1, which normally regulates gene activity and the packaging of chromosomes in a cell, can modulate the cellular response to DNA damage. 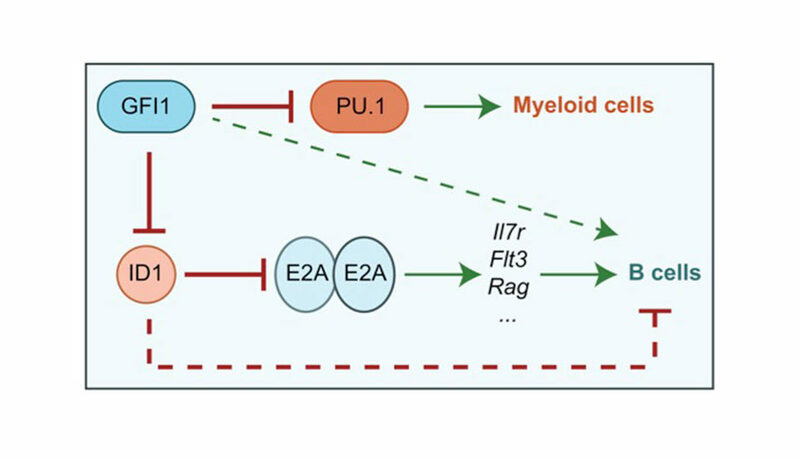 Cells that lack Gfi1 overreact to the DNA damage signal and accelerate the initiation of programmed cell death. 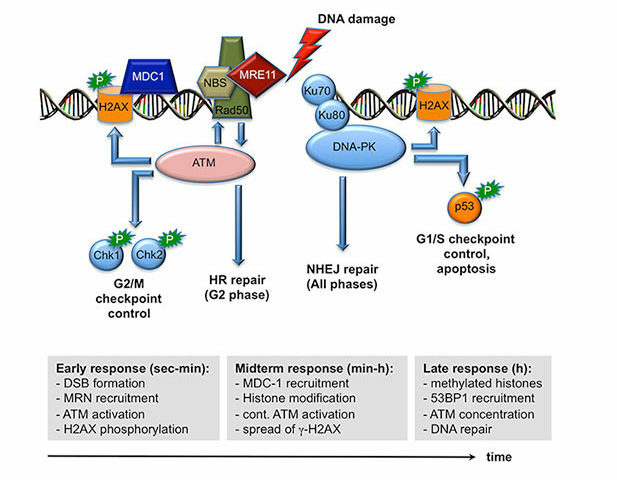 Of interest, DNA damage is also the underlying cause for the anti-cancer efficacy of ionizing radiation and many chemotherapeutic drugs. 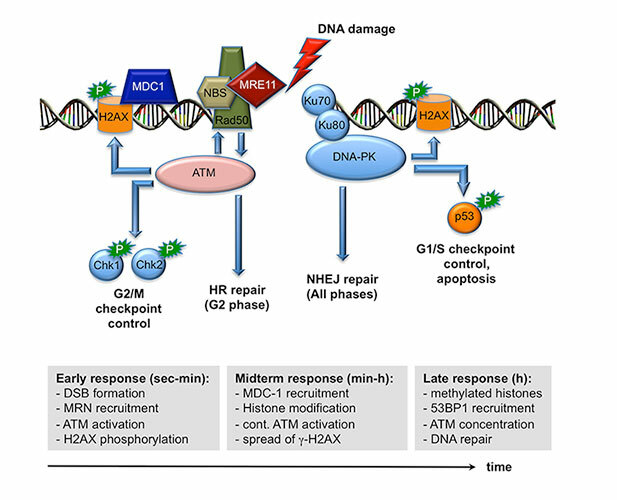 Thus, a better understanding of the pathways and regulatory mechanisms of the cellular response to DNA damage is important for making further advances in cancer treatment. In particular, one way to improve cancer therapy would be to selectively sensitize tumor cells to DNA damage inducing drugs or gamma radiation, thus allowing the use of lower doses to effectively cure or control the disease while obviating unwanted side effects. In this project, we intend to clarify the role of the Gfi1 regulatory protein in this process and in the DNA damage response. 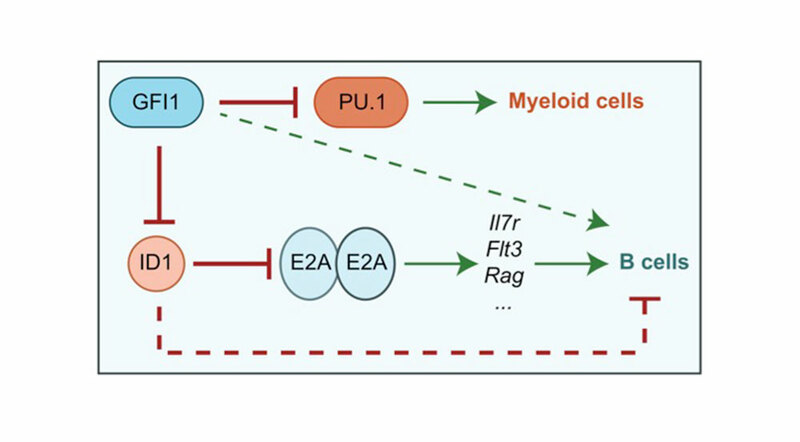 We propose that in particular blood cells need Gfi1 to counteract a destructive DNA damage response pathway. 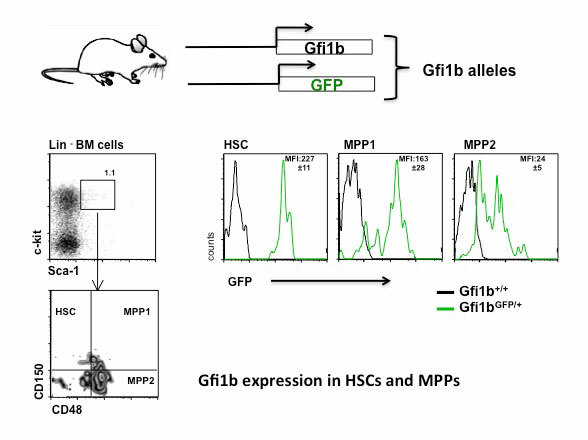 Our work will clarify which effect the ablation of the Gfi1 protein has in blood cells and whether or how Gfi1 deficiency can sensitize them to an accelerated death. This knowledge can be used for a future therapeutic strategy, in which blood cancer cells (leukemia cells) are sensitized to accelerate their self-destruction during a therapy with chemotherapeutic drugs that cause DNA damage.